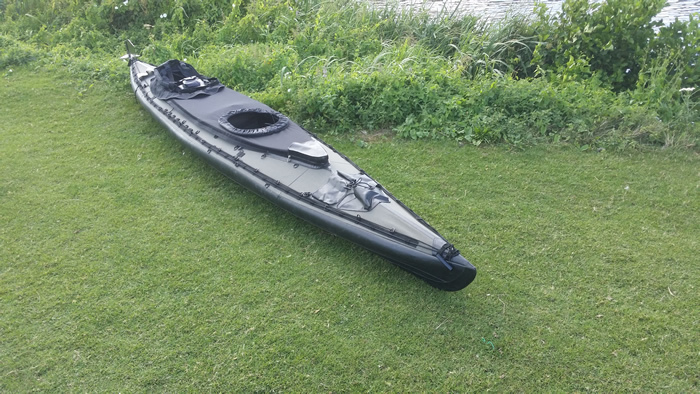 1) Kayak skin backpack bag with intergrated loading tray. With the bag empty, the bag folds into itself and becomes a loading tray. This loading tray can then be hooked onto the rear deck creating a flat platform with sides. This tray can be used in one of two ways. 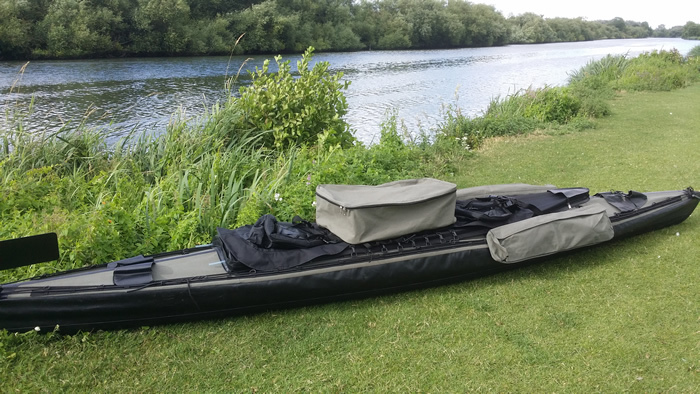 A - for example, when scuba diving, you can put small kit in this tray - this provides easier access as opposed to reaching inside the kayak. 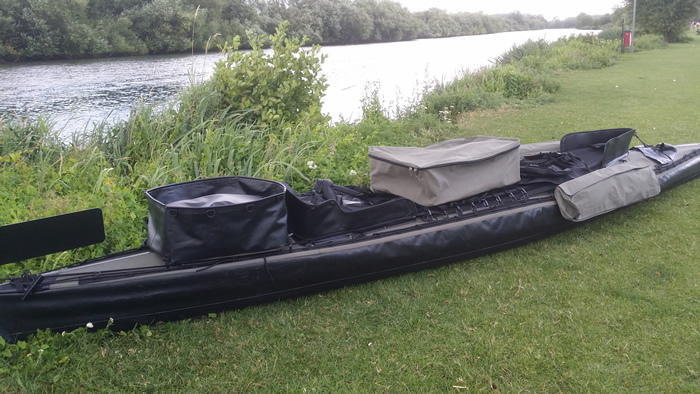 B - The tray sides have eyelets - you can use elasticated cord / net (not included) to secure kit. 2) Central net platform. Made of straps, this net is fitted tightly across the cockpit between the front and rear paddler. 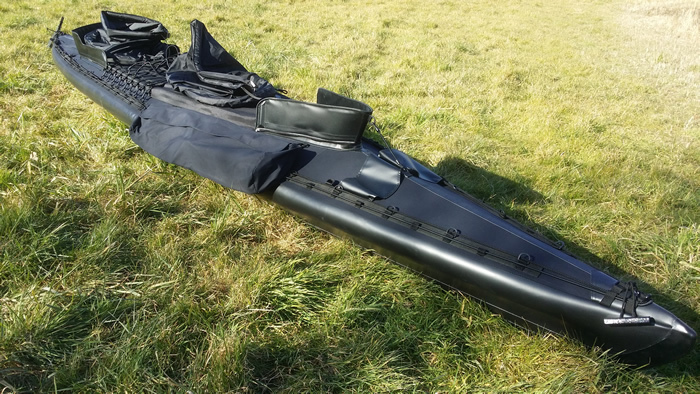 This prevents the spraydeck from needing to take the weight of any kit stored at that location, preventing spraydeck sagging. 3) Central deck storage bag. With attachments to secure firmly to the net platform. 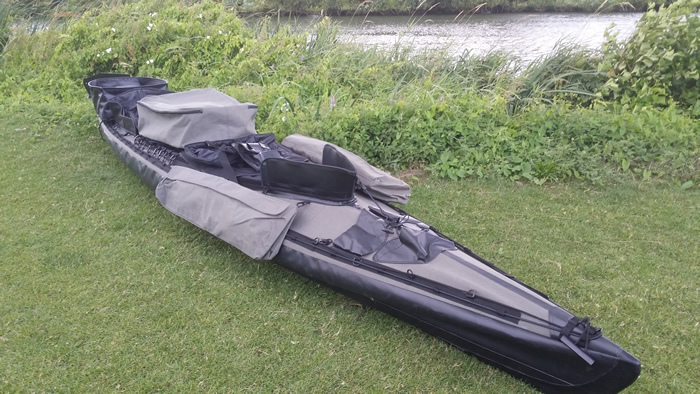 This large bag can be used to store any kit that the rear paddler would like to have ready access to.This bag is 'spare' - it is not actually required to store any kayak parts whilst disassembled. 4) Central deck cargo net. 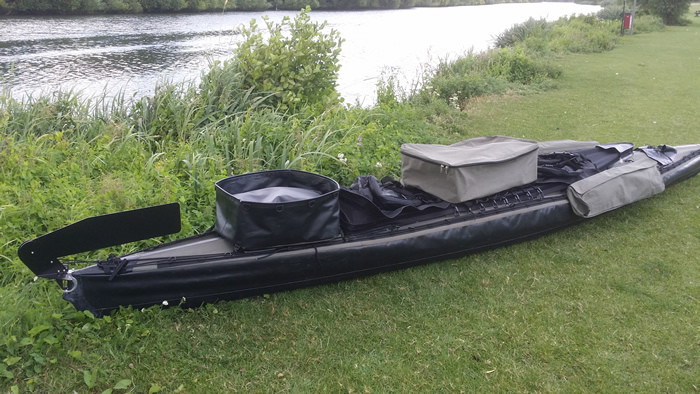 If not using the central deck storage bag, then this cargo net can be used to secure own kit bags. 5) Front side pannier bags. 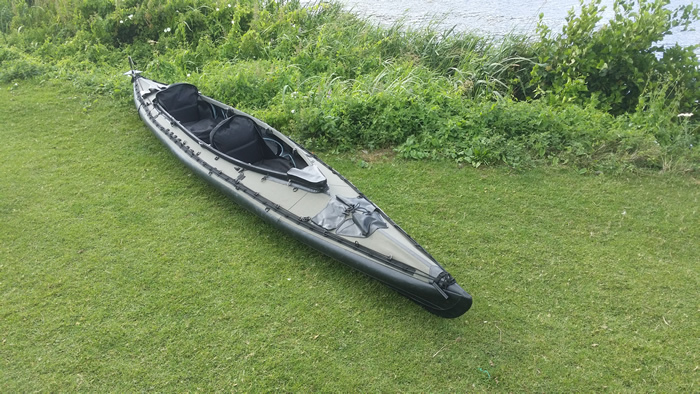 Accessible to the front paddler. 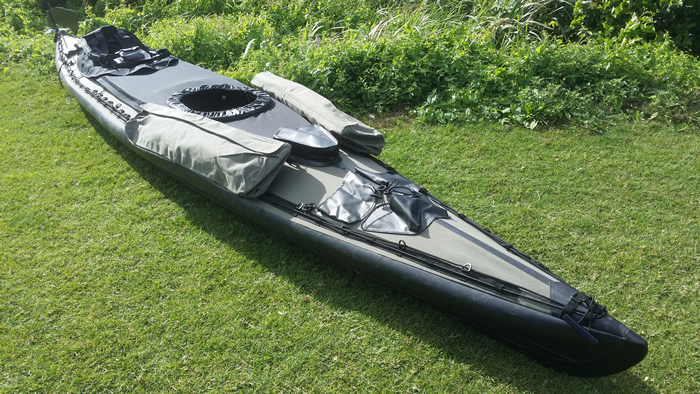 6) Kayak skin backpack bag with integrated loading tray. This very large bag, once emptied, can be collapsed into itself and zipped closed forming a tray. This tray is attached to the rear deck creating a level platform with sides. 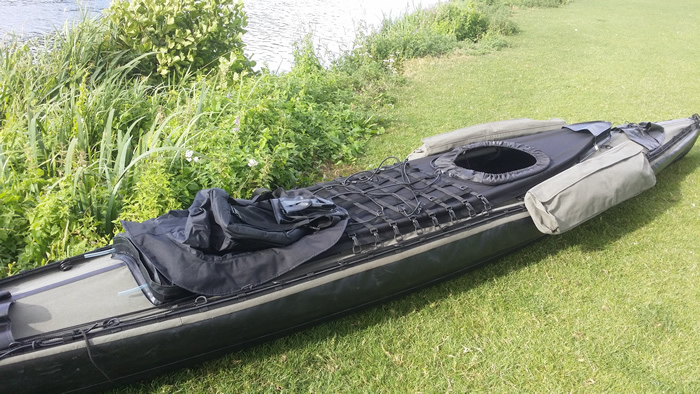 Useful if diving - place small items in this tray for easy access (as opposed to reaching inside the kayak) from the water, or as an extra storage location for large kit. There are D-rings around the perimeter of this tray - to attach elastic cord / net (not supplied). 7) Removable front and rear high washboards. Designed to deflect water when paddling through surf, reducing the impact against waist skirts / jackets. Central platform fitted with elastic cargo net attached. At this point, the sponsons were not fully re-inflated after fitting the platform - an oversight. The edges of the hull should be smooth with no ripples as in the 1st 2 photos. It is possible to fit this cargo platform without the spraydeck should you require it.